The Little Tug that Could – Again! 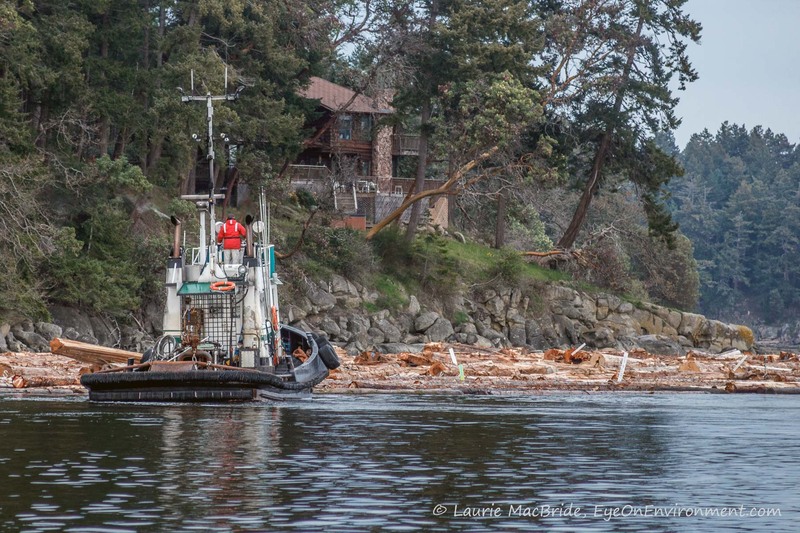 When I photographed the Samantha J in Gabriola Passage in 2012, I had no idea that this hard-working tugboat was soon to become part of local maritime history – twice! But first, a bit of background. Log booms are normally pulled by a single tug, but you’ll note there are two tugs in the photo above. Navigating Gabriola Pass demands tight reins, especially at the narrow east end, where a sharp turn is needed. So while one tug pulls, a second one often pushes from behind, to prevent the boom from swinging onto the rocks or into oncoming boat traffic. Extra control like the Samantha J provided that day is essential in a tight situation like this, where a tidal current often adds to the challenge. It’s a slow process to move a large log boom, and it would be foolhardy for any vessel to attempt to go around a tug and boom in a narrow channel. So patience was required when, arriving at the pass on our way home, we saw the two tugs and boom ahead of us. My husband, at our helm, was frustrated by the pace. On the other hand, I was delighted to have a lengthy opportunity to photograph the operation up close. I’ve always found tugboats fascinating. Fast forward to two and a half years later: in October 2014, Samantha J made local headlines when it sank in nearby Northumberland Channel after being run over by the barge it was towing. The two men on board managed to climb onto the barge and were rescued from there. Samantha J was in the news once again in early March 2019, this time for being successfully raised from 220 feet of water – quite the engineering feat! If, like me, you’re a fan of the late, great singer-songwriter, Stan Rogers, you may be inspired to think of the Mary Ellen Carter. But the raising of the Samantha J was not driven by a passion for the beautiful lines or nautical history of the vessel. It was simply that the sunken tug’s resting place was blocking one of the government-approved anchorages for the seemingly endless line of huge freighters and bulk carriers waiting to dock in the Port of Vancouver. No longer could the Samantha J rest in peace – the spot was needed by industry. 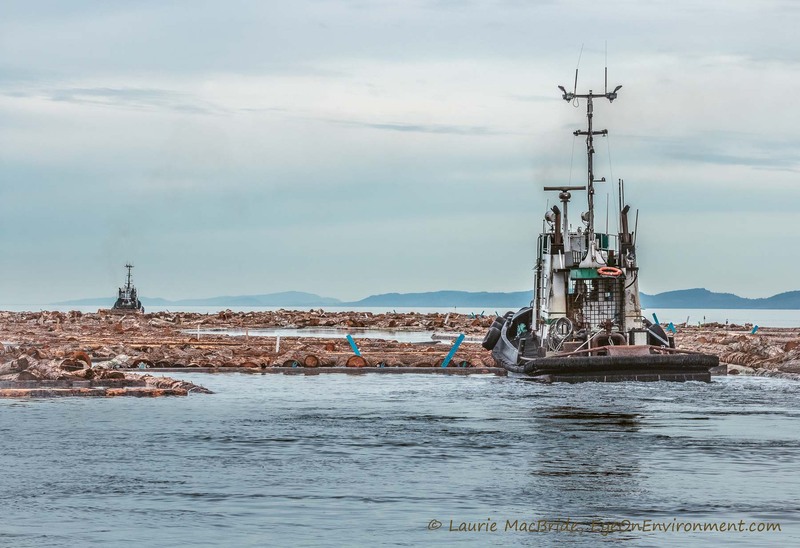 Posted by Laurie MacBride, Eye on Environment on March 30, 2019 in BC coast, Boating, Coastal History, Gulf Islands and tagged boating, forest industry, Gabriola, navigation, ocean, safety, Strait of Georgia, tidal passages, tugboats. Fred the old tug boater and Stan Rogers fan says good blog! Thanks, Fred – having read (and enjoyed) your book from your tugboat days, I figured you’d like this one. © Laurie MacBride, EyeOnEnvironment.com, 2019. Unauthorized use and/or duplication of this material without my express permission is prohibited. Text excerpts and links may be used, as long as clear credit is given to Laurie MacBride, EyeOnEnvironment.com, with direction to the original content.